ICA Miami welcomes Allora & Calzadilla to ICA Speaks. Through a complex research-oriented practice, Allora & Calzadilla critically address the intersections and complicities between the cultural, the historical and the geopolitical. The interdisciplinary nature of their interventions is echoed by an expanded use of the artistic medium that includes performance, sculpture, sound, video and photography. Their dynamic engagement with the art historical results in an acute attention to both the conceptual and the material, the metaphoric as well as the literal. The Puerto Rico-based artists have studied the ephemeral nature of collective drawing with monumental sticks of chalk at the Biennial de Lima, Peru (Chalk [Lima], 1998–2002); the imprints of colonial, nationalist, and military violence on the diverse populations and landscapes of Vieques, Puerto Rico (Land Mark (Foot Prints), 2001–2002; Land Mark, 2003; Returning a Sound, 2004; Under Discussion, 2006 and Half Mast/Full Mast, 2011); and the resonance of playing, warping and combining music from various moments in history (Clamor, 2006; Wake Up, 2007; Sediments Sentiments- Figures of Speech, 2008; Stop, Repair, Prepare: Variations on Ode to Joy for a Prepared Piano, 2008; Raptor’s Rapture, 2012; Apotomē, 2013; 3, 2013); as well as the entanglement between biophysics, semiotics and actuality (Growth, 2004; Puerto Rican Light: Cueva Vientos, 2015). Jennifer Allora (b. 1974, Philadelphia, Pennsylvania) received a BA from the University of Richmond in Virginia, USA (1996) and an MS from the Massachusetts Institute of Technology, USA (2003). Guillermo Calzadilla (b. 1971, Havana, Cuba) received a BFA from Escuela de Artes Plásticas, San Juan, Puerto Rico (1996) and an MFA from Bard College, USA (2001). Collaborating since 1995, Allora & Calzadilla represented the USA in the 54th Venice Biennale, Italy (2011). Solo exhibitions include Fundació Antoni Tàpies, Barcelona, Spain (2018), MAXXI, Rome, Italy (2018), Museo de Arte Moderno de Medellín, Colombia (2018), Art Gallery of Alberta, Canada (2016), Dia Art Foundation, Guayanilla-Peñuelas, Puerto Rico (2015), Philadelphia Museum of Art, USA (2014), Indianapolis Museum of Art, USA (2012), Haus der Kunst München, Munich, Germany (2008), Stedelijk Museum Amsterdam, The Netherlands (2008), Kunsthalle Zürich, Switzerland (2007) and Walker Art Center, Minneapolis, USA (2004). Among numerous group exhibitions, they participated in the 10th Gwangju Biennale, Gwangju, South Korea (2014), Documenta 13, Kassel, Germany (2012), Performance 9 at the Museum of Modern Art, New York, USA (2011) and the 29th São Paulo Biennial, Brazil (2010). 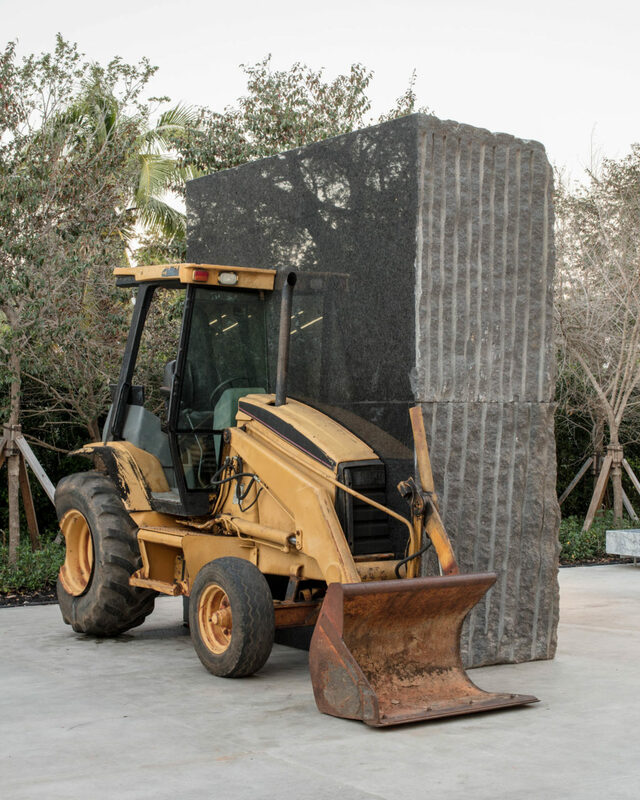 Allora & Calzadilla. Courtesy the artists. Allora & Calzadilla, Unspecified Promise , 2017. American Black Granite, 1993 Caterpillar 416 Series Loader Backhoe. Collection of Institute of Contemporary Art, Miami. Museum purchase by Allora & Calzadilla Circle: Margot and George Greig, Helen Kent-Nicoll and Edward Nicoll, Ray Ellen and Allan Yarkin. Additional support from Barbara Z. Herzberg, Amy Dean and Alan Kluger.